Well, we got that taken care of but it was so nice out that one thing led to another. Right away I was distracted by the stray impatiens that keep popping up along the stone pathway. They grow so quickly in this winter climate that it seems all of a sudden a stepping stone is missing when really it is just covered up by another impatien plant. They are easily transplanted so I got right on that little task. Finally some rain is in the forecast for tomorrow. We haven't had any in so long. Our late December/early January weather has been extremely mild. I'm having to remind myself it isn't spring yet. Making cuttings from begonia stalks and persian shield and purple queen and sticking them in the ground seemed like a perfect thing to do as I moved from one area to the next. No great loss if they don't make it. But they will probably do just fine barring any freezing temps. 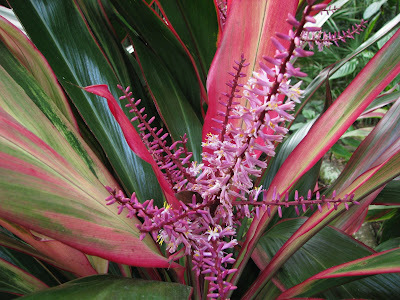 Would you like to rest your winter-weary eyes and have a look around at some of the plants enjoying our Florida, zone 10 winter? My mind was racing today with plans for new beds and how to get them planted out on a budget. I'm not sure if I've featured my staghorn fern on this blog in the past. It hangs from the support of an oak tree limb in the back garden. They are slow growers but I think this one must be in the perfect spot because it has gotten big faster than usual ... I think anyway. My bamboo chimes are situated underneath. How peaceful is their gentle sound to my ears while I'm out and about in the garden. 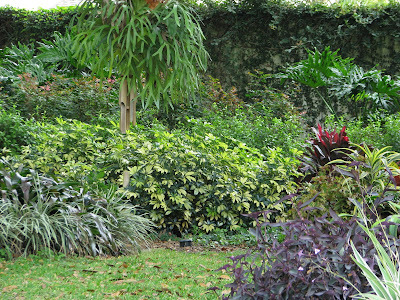 In the same planting bed is the diplademia vine growing on a trellis. It has several new buds and blooms. 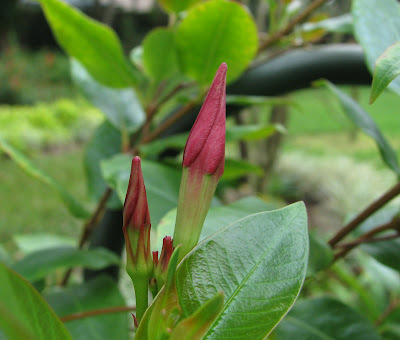 But ... it is pretty much an all-year bloomer so not too surprising it is budding now. Even as winter continues to unfold, throughout the garden the sound of buzzing critters fill my ears. Some I can easily see and some I only hear while we work together. Beneficials their called. I'm happy to have them as my companions. 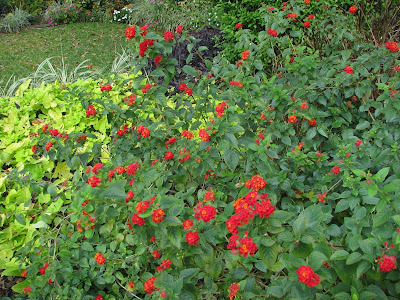 The deep orange lantana that I've shown you before continues to amaze me. Not only because it stands almost as tall as me and is more than six feet wide but also because it stays covered with flowers... and bees... and when the sun is shining ... skippers ... and butterflies. 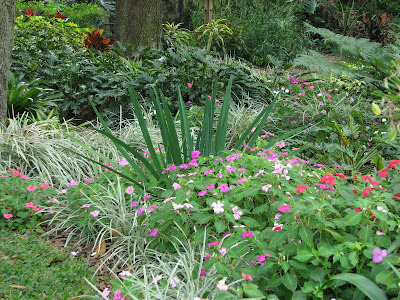 And there are some more of those stray impatiens voluntarily positioning themselves outside the borders. Oh well, we'll leave them there at least until spring. This time of year we like all the color we can get and they are happy to provide it. ... the leaves and the blooms of every draceana is flourishing at an abundant rate... easy performers they are and adding cheer to the back garden. Your title is just what I needed to see this morning what with snow about to hit our area. Your new header photo and wallpaper is pretty on your blog too but that garden is certainly a sight for winter-weary eyes. I love that staghorn fern. My Sister brought me one from FL a few winters ago. It has survived but I can't say it has thrived. It was in a stainless steel basket and I just mounted it onto a piece of log this fall. It seems to have liked its move. It is still alive and has a few new fronds anyway. It is growing oddly. It is like they put two together back to back in the top of the basket and they have grown together. I hope they adhere to the log and grow now. Just seeing all your blooms makes me wish I could dash out and purchase some plants. Ha.. I will just get busy and water my indoor plants well today. Indeed, your garden is an escape from our gray landscapes. I've never seen a dracena bloom! I didn't know what I was missing until now. The fern is gorgeous, too. 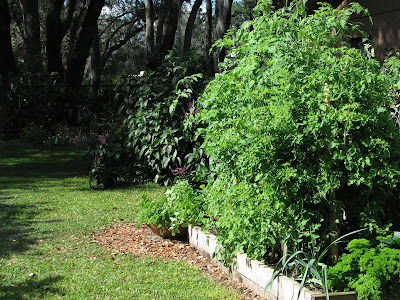 Your tomato plants are humongous! How awesome to be able to grow a veggie garden in winter! We've had such great weather! I'm so grateful that we don't have to go through freezing rain and snow. Looking at your garden sure does make one wish for spring. Beautiful photos Meems! I can feel the warmth through those photos. I'd only seen staghorn ferns growing in glass houses - they really do make wonderful accents. Thank you for bring a little of the tropics into my day. Lisa, I'm happy you like the header and paper - it's always fun to change things up a bit. Good to hear your staghorn has survived... I have a feeling the two will merge. 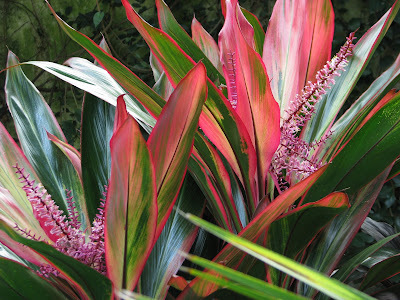 Yours will probably grow much slower in your environment but they are extremely hardy... don't even need any soil. Cameron, I wouldn't say it's paradise but I am happy it stays green and sunny here. It is grey and rainy today and I'm trying to imagine what it must be like to look out at this so many winter days and to also not have a thriving garden at the same time... I don't think it would be the life for me. Marnie, Given the right conditions the staghorn can get extremely large ... my dad has one 4 x's that size. He is the one that started this one for me a few years ago. Linda, I had no idea this vining variety of tomatoes would be so out of control ... I just keep tying up and staking up and they are so crowded now I'm not sure the middle is getting any sunlight. sigh. More lessons learned. Meems, everything looks so beautiful. It's hard for me to believe it's winter there. There is a great difference between Zones 10 and 7! Thank you for a bit of summer (to me) on a cold, dreary, rainy winter day. 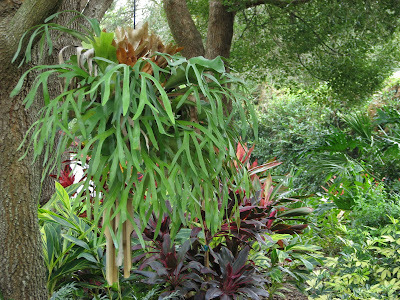 I find myself lusting over your staghorn fern - Amazing! Dani, Oh my. It has been so perfect. I wouldn't mind it being a little cooler which we are actually getting a little cooler tonight... but this is my kind of gardening weather. I really have a hard time coming indoors when I get started outside. Now summer? That's a different story. Cheryl, I guess you must get used to the kind of weather you are having... your garden certainly is beautiful in spite of it. Colder than Iceland sounds really cold to me. Hope you are staying cozy and warm. 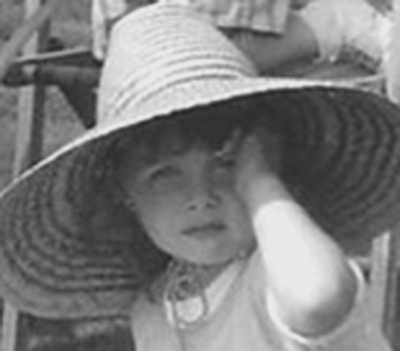 Susie, I'M even wishing for spring just to have the go ahead to do some things I'm getting anxious to do. Like every other year it will be here before you know it. Barbara, with all the snow you have right now you could use some warmth... geesh... I don't know how people get around in that much snow. thanks for popping in for some greenery. Racquel, You made me chuckle thinking of what your definition of mild is compared to my definition. Happy to have you visit anytime for a little dose of greenery. Kim, You all have had your share of rain I've noticed on the weather reports... we finally got just a little today... not enough but a little. It's getting colder tonight... I think down to 49. Not a big deal but a big change. I'm glad I like it. Yes, big difference between 7 and 10 ... actually big difference between north Florida and here, too. Mary Beth, Are you serious? I would think you could grow them where you are, too... do you just not have enough shade???? BTW, good to see you... it's been a while. Thank you, I also needed to see all of that vibrant color. Not because of snow, just because!! WOW your garden is breathe taking. I must agree with the other posts, it really is a site for sore winter eyes. It was amazing to see such green plants and grass when we were home last week. I will definitely keep checking back to bright my spirits! How lovely, Meems. Your garden always shows beautifully ... because your garden is you. 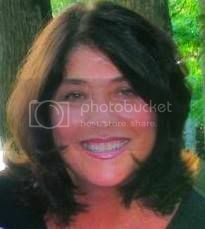 Darla, Gosh, just to think I could add some color to your day thrills my heart. My prayers are with you as you get to the other side of the troubles that have visited you lately. Ehrenfelds, Hey! Anytime you need a "green fix" you can pop over. What an adjustment you have had to make from Florida to Dakota. YOU are a braver girl than me any day! You military wives should all get medals of honor. Thanks for doing what you do! VW, You must really miss California during the winter months. Whenever I visit snow I never want to be the one driving in it. I can imagine it gets old. My tomato plants are as tall as the one-story eaves. I have to keep cutting stakes a little taller and a little taller. I'll know next time I plant this variety but I had NO idea this time. Thanks for coming by today. 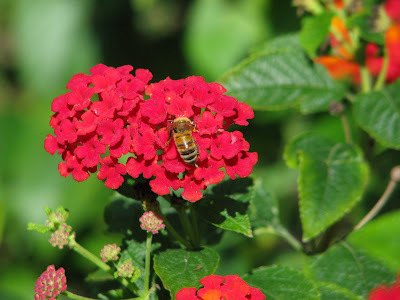 Susie, I have every color of lantana planted in my garden. Some in pots, but mostly in the ground... except for the light pink/yellow variety that grows wildly along the roadsides. In my experience each variety has different habits. For instance the lavender and white are blooming profusely now but really don't love the humidity so even though they stay green in the summer they only bloom sporadically. If you find some of the deep orange be sure to find a sunny, dry spot in your shady garden. It won't be happy otherwise. Joey, Have I told you lately there is nothing ho-hum about you. Who coined that phrase anyway? Thank you for your always cheery and kind visits. Blessings to you for a beautiful day. Tessa, Welcome. Thanks for dropping by Hoe & Shovel. And thank you for the fave over at Blotanical. We do have to look ahead to the things that inspire us when our gardens and the gardener is longing for spring to come. It will be here before we know it... but waiting can be challenging. Just what my winter weary eyes needed today. The snow is melting and now we have...brown. Not sure that is an improvement, but it is nice to have warmer temps. We even had some sun for a couple of hours yesterday, sigh. January is the longest month of the year for me. So I'm happy to take a virtual walk through your lovely garden. Thanks! 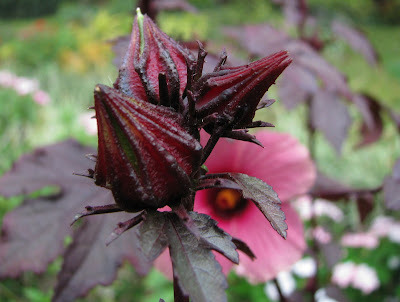 I never seen a maple-leaf hibiscus; I want one. Your garden looks fantastic. Connie, So glad to hear of the sunshine for a little bit yesterday. Everytime I think about how far north you are it makes me shiver. Good news: January is almost half way over and spring really is on its way. We just have to keep looking forward .. it will be here before you know it. Rusty: I had not heard of the maple leaf either until I found these at my local nursery. 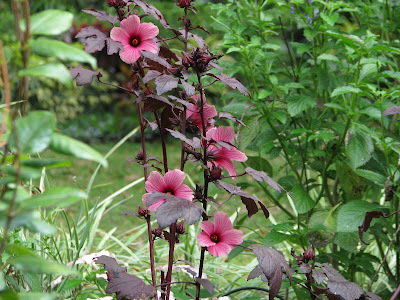 I am really loving the deep magenta foliage. Can't wait until the spring to see them bush out like a shrub. Add me to those who thinks a visit to your garden and blog is just the cure for MY winter-weary eyes, given that we have several feet of snow all around our place and the only flowers are the rapidly-tired poinsettia, the aloe, and the brave azalea--and they're all indoors, obviously. So I had a great time exploring your garden joys! Jodi, so glad you stopped by for a shot of green. Hope you are recovering well also. Thank goodness for the indoor plants that bring some life when the outdoors is white with that magical snow. 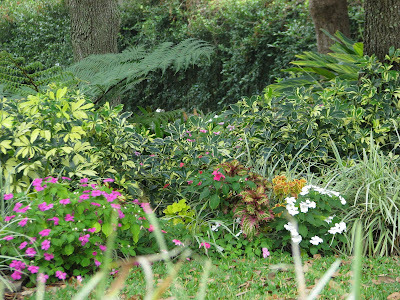 We have green in Austin, but it's mostly from evergreens, not the lush growth of your Florida garden, Meems! Your staghorn is wonderful! My young staghorn is in a hanging coco basket so it can come in and out with the frosts or freezes. It's okay if it grows slowly - I won't be able to carry it inside if it gets as big as your dad's fern.